This article is about the Major League Soccer team. For the USL Pro team, see Orlando City SC (2010–14). On October 25, 2010, Phil Rawlins and his investor group of Orlando City Soccer Club, announced their intentions of joining Major League Soccer within the next three to five years. On February 28, 2011, Orlando City announced it met with commissioner Don Garber and league officials concerning expansion. Topics covered included the demographics of the Orlando marketplace, the local corporate and fan support for soccer, and developing a roadmap for a future MLS franchise in Orlando. Orlando City team officials met with Commissioner Don Garber again on November 10, 2011 for further discussions about joining the MLS as its 20th club (which ultimately went to New York City) in 2013. Brazilian World Cup-winner Kaká was the team's first Designated Player. On March 1, 2012, Garber visited Orlando to meet with city and county officials. He stated, "It's not a matter of if, but when", when addressing Orlando's chances of joining MLS. On August 31, 2012, Rawlins told the Orlando Business Journal the team could get the Major League Soccer approval as early as late 2013, and be ready to play in the league by 2014 or 2015. Rawlins said to make that happen, the league had asked the team to explore building a 22,000-seat soccer-specific stadium. "They didn't say we had to have a stadium built before we could join, but they at least would like a plan that it's happening." On November 19, 2013, Orlando City SC was announced as the league's twenty-first franchise. The team's new logo was unveiled in May 2014 and the team signed their first player to an MLS contract, former Brazil international Kaká, a month later. Kaká, who also became the team's first Designated Player after his release from A.C. Milan, was immediately loaned to São Paulo until the start of the season. In the same month, Orlando City announced a partnership with Benfica. As part of that partnership, Orlando City later signed two players from the Benfica's U19s – Estrela and Rafael Ramos – to MLS contracts on August 7, 2014. On November 21, 2014, Adrian Heath signed a contract extension committing him to the club through to the end of the 2017 MLS season. As an expansion team, Orlando had first pick in the 2015 MLS SuperDraft, and used it to pick Canadian forward Cyle Larin. The team hosted their first MLS game at the Citrus Bowl on March 8, 2015, against fellow expansion team New York City FC, in front of a crowd of 62,510. Kaká scored the club's first goal in stoppage time to earn a 1–1 draw. In the following game, they defeated Houston Dynamo 1–0 on the road, marking their first victory. On March 21, Orlando conceded a late stoppage time goal to Octavio Rivero of Vancouver Whitecaps for their first defeat. In their inaugural season Orlando City finished 7th in the Eastern Conference and 14th in the overall standings, falling short of the playoffs by one point. Larin scored 17 goals across the season, breaking Damani Ralph's record of 13 as a rookie and earned the MLS Rookie of the Year Award. Midway through the 2016 season, following disappointing results and performance of the team, long time head coach Adrian Heath was fired in July 2016. In that same month, Orlando City announced Jason Kreis as the franchise's new head coach. However, the Lions ended the season missing the playoffs once again. In 2017, the Lions moved to the purpose built Orlando City Stadium. The team once again struggled and attempted to improve during the summer transfer window by acquiring Sporting Kansas City striker Dom Dwyer who had played for Orlando City's USL Pro team on-loan in 2013, most notably scoring 4 goals in the USL Pro Championship Final. The club traded incentives totaling to $1.6 million, a record trade between two clubs within MLS. At the end of the season, Kaká announced that he would not return for Orlando City and soon after confirmed his retirement. Fifteen games into the 2018 season, Orlando City released head coach Jason Kreis after a 6–8–1 record to start the season and an overall 21–29–14 MLS record over nearly two seasons. Two weeks later, USL club Louisville City FC announced head coach James O'Connor, a former defender and assistant coach of the original Orlando City franchise, was to become Kreis's replacement. However, O'Connor only managed 2 wins in his 18 games in charge in 2018 as City missed the playoffs for the fourth consecutive season and also set a new MLS record with 74 goals conceded on the year. In April 2013, the City of Orlando purchased downtown land for $8.2 million to be used towards the construction of a $110 million MLS soccer stadium. However, in May, the Florida House of Representatives failed to vote on a bill that had passed the Senate that would have provided up to $30 million in state funds towards the stadium project. Rawlins responded by expressing his intent to find alternative funding and keep seeking MLS expansion. The mechanism to allow for the sales tax rebate for the MLS team was ultimately passed on April 25, 2014. The Orlando downtown soccer stadium moved closer to securing funding on August 8, 2013, when Orange County Mayor Teresa Jacobs and Orlando Mayor Buddy Dyer reached an agreement on a deal to provide financial support for a variety of Orlando projects including the new MLS soccer stadium. The last piece in stadium funding was an October 2013 vote on using an existing tourism tax to fund the final quarter of the $80 million stadium project. On October 22, 2013, the Orange County Board of Commissioners voted 5–2 to approve the use of $20 million in tourist development tax funds to build an $84 million multi-purpose soccer stadium in downtown Orlando. On May 29, 2015, after two years trying to get funding from the state of Florida, Augusto da Silva announced that the stadium would be built with 100% private funds and would be owned and operated by the club. He also announced the capacity would be increased to between 25,000 and 28,000 and that the club would buy the initial location from the City of Orlando. On March 5, 2017, Orlando City hosted New York City FC in the stadium's inaugural match to begin the 2017 season. Cyle Larin scored the first goal in stadium history as Orlando City won 1–0 in front of a sellout crowd of 25,550. Orlando City Stadium became the first venue to host an MLS, NWSL, and USL team all in the same location. The stadium has also played host to several nationally relevant matches. On October 6, 2017, the United States Men's National Team played its 2018 World Cup Qualifier against Panama in the stadium. The following week the 2017 NWSL Championship game between North Carolina Courage and Portland Thorns was also played there. Orlando City Stadium is set to host the 2019 MLS All-Star Game. Camping World Stadium (pictured), Orlando City's home venue for their first two seasons. Prior to the completion of Orlando City's soccer specific stadium, the Lions had occupied the then named Citrus Bowl for their first two seasons in Major League soccer, which the team had also invested in for renovations. In the opening home matches of the 2015 and 2016 seasons, Orlando City ran their "fill the bowl" campaign which led to sell-out crowds of over 60,000. Orlando City had averaged over 30,000 in attendance in their home matches while using the stadium. MLS dissolved its reserve league in 2014. Like most MLS teams, Orlando now has a USL affiliate by way of Orlando City B, a USL League One team based at Montverde Academy. Orlando City originally had an affiliation agreement with Louisville City FC, the club that bought the USL license from the owners of the Orlando City. The agreement provided that Orlando City will loan at least four players to Louisville City during the season. In 2016, Orlando City ended their affiliation with Louisville and began its own USL expansion franchise OCB who originally played at Titan Soccer Complex. The team played two seasons in USL before going on hiatus in 2018. The team returned in 2019 following a league restructure and became a founding member of USL1, the third tier of the US Soccer pyramid. In 2010, the founding year of Orlando City's original USL franchise, the team allied with Central Florida Kraze of the Premier Development League to assist player development. Following their successful first season, Orlando City acquired a controlling interest in the Kraze and renamed them Orlando City U-23. The team has a legacy that includes several current and past MLS players, and won the PDL Championship in 2004. In lieu of OCB's creation, the U-23 team was folded after the 2015 season. After their 2011 season, Orlando City also acquired controlling interest in the Florida Soccer Alliance youth soccer club, renaming them Orlando City Youth Soccer Club. The club is now a member of the Elite Club National League (ECNL) and has several boys and girls teams competing at local, state and national level with age groups from 8-18. The current logo of Orlando City was unveiled in 2014. The main aspects of the franchise's identity carried over from the previous logo of the USL pro team. New features and changes were introduced representing a transition, of the franchise, into the top tier of the United States' soccer pyramid. The logo consist of a gold Lion face with 21 sun flares as its mane in a purple shield, with a white outline being the official colors of the team. The number of flares represents the club as the twenty-first team in MLS, while the mane also forms a sun in reference to Florida's nickname as The Sunshine State. The team name is also seen in the logo in white. Orlando Health has been the official shirt sponsor for Orlando City SC since the team's inception as a USL franchise in 2010. In 2013, Orlando Health extended its partnership with the club, becoming the first jersey partner in MLS history to commit to an expansion club prior to its admittance to the league. Adidas also signed on as the club's kit provider for the 2015 season as per the league-wide deal made by MLS. The deal means that there are no longer third kits and only one kit (between the home and away) is permitted to change per season, rotating on an annual basis. The club had sold over 13,000 season tickets before playing its first match in March 2015, and reached its cap by selling out all 14,000 available season tickets later that month. As of the 2017 season, Orlando City's season ticket base stands at a cap of 18,000. The club has two major active supporters groups, which combine forces on game days to create "The Wall" now housed in the safe standing section: The Ruckus and The Iron Lion Firm. The Ruckus is the oldest of these groups founded in 2010, whose basis was formed in 2009 as the "Orlando Soccer Supporters Club" without an affiliation to any particular soccer team. The Iron Lion Firm separated from The Ruckus prior to the start of City's first season. The club also has officially recognized international fan clubs in both Brazil and the United Kingdom. On March 3, 2015, the team announced all 60,000 available seats in the Citrus Bowl were sold out for the team's home opener versus New York City FC, and also announced they were close to selling out the second home game versus Vancouver Whitecaps FC. On April 21, 2015 the club announced it had reached its goal of 14,000 Season Ticket Members and was starting a waiting list moving forward. Orlando City averaged 32,847 fans in its first season, ranking second in MLS behind Seattle Sounders. ^ Tenorio, Paul (April 7, 2015). "Orlando City's Cyle Larin improving rapidly, may start for Lions". Orlando Sentinel. Archived from the original on April 8, 2015. Retrieved April 8, 2015. ^ a b "Major League Soccer names Orlando City SC as 21st franchise, set for 2015 debut". Major League Soccer. November 19, 2013. Archived from the original on November 23, 2013. Retrieved November 20, 2013. ^ "Major League Soccer Awards Expansion Team to Orlando". Orlando City SC. November 18, 2013. Archived from the original on March 13, 2015. Retrieved November 19, 2013. ^ "Orange County Approves Funding for Orlando Soccer Stadium". orlandocitysoccer.com. Retrieved October 24, 2013. ^ "MAJOR LEAGUE SOCCER AWARDS EXPANSION TEAM TO ORLANDO". orlandocitysoccer.com. Retrieved November 20, 2013. ^ Borg, Simon (October 25, 2010). "Investors targeting MLS club for Orlando". MLSsoccer.com. Archived from the original on April 11, 2011. Retrieved February 22, 2012. ^ "Orlando City Meets with Major League Soccer to Discuss Expansion Plans – OurSports Central – Independent and Minor League Sports News". OurSports Central. February 28, 2011. Archived from the original on December 3, 2013. Retrieved February 22, 2012. ^ Wiebe, Andrew (November 10, 2011). "Garber: League still focused on expansion team in NYC". MLSsoccer.com. Archived from the original on November 13, 2011. Retrieved February 22, 2012. ^ "Orlando City put MLS ambitions on show for Commissioner". MLSsoccer.com. March 1, 2012. Archived from the original on October 24, 2012. Retrieved October 25, 2012. ^ "Orlando City Lions may score MLS dream with stadium – Orlando Business Journal". The Business Journals. August 31, 2012. Archived from the original on March 14, 2014. Retrieved October 25, 2012. ^ Tenorio, Paul. "Orlando City Soccer Club reveals new MLS logo". Orlando Sentinel. Archived from the original on May 13, 2014. Retrieved May 13, 2014. ^ "Kaka: Brazilian to join Orlando City via Sao Paulo after AC Milan exit". BBC Sport. June 30, 2014. Archived from the original on July 1, 2014. Retrieved June 30, 2014. ^ "ORLANDO CITY SIGNS BRAZILIAN SUPERSTAR KAKA". Orlando City SC. July 1, 2014. Archived from the original on July 7, 2014. Retrieved July 1, 2014. ^ "BENFICA AND ORLANDO CITY SC ANNOUNCE STRATEGIC COOPERATION AGREEMENT". orlandocitysoccer.com. Archived from the original on June 14, 2014. Retrieved June 6, 2014. ^ "News". Orlando City Soccer Club. Archived from the original on August 26, 2014. ^ "Orlando City SC Extends Head Coach Adrian Heath's Contract Through 2017". Orlando City Soccer Club. Archived from the original on November 29, 2014. Retrieved November 26, 2014. ^ "Orlando City selects Cyle Larin with No. 1 pick in MLS SuperDraft". ESPN. January 15, 2015. Archived from the original on February 26, 2016. Retrieved November 12, 2015. ^ Cunningham, Sam (March 8, 2015). "Orlando City 1–1 New York City: Kaka scores last gasp equaliser to deny David Villa victory as superstars make MLS debut". Daily Mail. Archived from the original on March 10, 2015. Retrieved March 9, 2015. ^ Limón Romero, Iliana (March 14, 2015). "Orlando City defeats Houston 1–0, earning Lions' first MLS victory". Orlando Sentinel. Archived from the original on March 16, 2015. Retrieved March 13, 2015. ^ "Vancouver Whitecaps' dramatic win over Orlando City tempered by Sam Adekugbe injury". Major League Soccer. March 21, 2015. Archived from the original on March 25, 2015. Retrieved March 22, 2015. ^ "Orlando City forward Cyle Larin named 2015 AT&T Rookie of the Year". Major League Soccer. November 10, 2015. Archived from the original on November 12, 2015. Retrieved November 12, 2015. ^ DelGallo, Alicia. "Orlando City fires head coach Adrian Heath". Retrieved November 7, 2017. 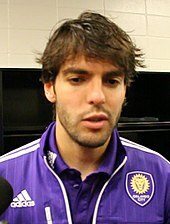 ^ "Kaká Leaves Lasting Impact on Soccer In Orlando". October 12, 2017. Retrieved November 7, 2017. ^ "Orlando City SC Agrees to Part Ways with Head Coach Jason Kreis". OurSportsCentral.com. June 15, 2018. ^ Rollins, Sean (2018-10-20). "Orlando City's New Record Has Been Coming". The Mane Land. Retrieved 2019-01-29. ^ "Dyer opens up about land purchase for new MLS stadium". wftv.com. Archived from the original on April 20, 2013. Retrieved April 17, 2013. ^ "Orlando City determined to join MLS despite legislation impasse in Florida House". MLSsoccer.com. May 6, 2013. Archived from the original on May 9, 2013. ^ "House passes stadium-subsidy bill which would aid Orlando, Miami MLS dreams". Orlando Sentinel. April 25, 2014. Archived from the original on July 31, 2014. Retrieved November 26, 2014. ^ Kennedy, Paul (August 9, 2013). "Mayors line up behind Orlando stadium deal 08/09/2013". SoccerAmerica. Retrieved September 12, 2013. ^ "MLS expansion team likely heading Atlanta's way". Sports Illustrated. Archived from the original on May 13, 2014. Retrieved September 13, 2013. ^ "'We are going MLS!' Pro soccer stadium is coming to Orlando". Orlando Sentinel. Archived from the original on October 23, 2013. Retrieved October 22, 2013. ^ "Orlando City SC to privately fund new stadium project, announce increase in capacity to 25–28,000". MLSSoccer.com. Archived from the original on October 3, 2015. Retrieved October 13, 2015. ^ "Lions Capture Clean Sheet Victory in Orlando City Stadium Debut". March 6, 2017. Retrieved November 7, 2017. ^ "Orlando City B To Play 2017 USL Season in New Downtown Soccer Stadium". Archived from the original on February 8, 2017. Retrieved February 7, 2017. ^ "Orlando City Stadium to Host U.S. MNT World Cup Qualifier". May 8, 2017. Retrieved November 7, 2017. ^ "Orlando City Stadium to Host 2017 NWSL Championship". April 22, 2017. Retrieved August 16, 2017. ^ "Orlando picked to host 2019 MLS All-Star Game". ESPN.com. 2018-09-13. Retrieved 2019-01-29. ^ "Orlando City fill the bowl for MLS opener". Orlando City. ^ Tenorio, Paul. "Orlando City to play 2016 season in Citrus Bowl; stadium to open in 2017". Archived from the original on November 21, 2016. ^ "MLS, USL Pro reach deal on restructured Reserve League". MLSsoccer.com. January 23, 2013. Archived from the original on January 26, 2013. ^ "Orlando City's USL PRO franchise to move to Louisville in 2015; will become MLS team's affiliate". MLSsoccer.com. June 4, 2014. Archived from the original on February 12, 2015. ^ "Orlando City USL franchise set to play in Melbourne in 2016". Orlando Sentinel. October 13, 2015. Archived from the original on October 15, 2015. Retrieved October 13, 2015. ^ "Our Academy - Orlando City Youth Soccer". ocyouthsoccer.com. ^ "Orlando City Unveils its New Major League Soccer Logo". May 13, 2014. Retrieved December 18, 2017. ^ a b "Orlando City SC and Orlando Health Unveil Inaugural MLS Home Jersey". OrlandoCitySC.com. November 5, 2014. Archived from the original on October 9, 2015. Retrieved October 13, 2015. ^ Ruthven, Graham; USA, Pro Soccer (2018-03-30). "Does MLS' deal with adidas stifle kit creativity?". Pro Soccer USA. Retrieved 2019-01-29. ^ "Orlando City surpasses 13,000 season tickets sold; ESPN pre-game show coming to Orlando", Orlando Sentinel, Paul Tenorio, February 26, 2015. ^ "NYCFC hits 16,000 mark in season-ticket sales" Archived April 12, 2015, at the Wayback Machine, Soccer America, Ridge Mahoney, April 8, 2015. ^ DelGallo, Alicia. "Orlando City 2017 season tickets sold out". Retrieved August 16, 2017. ^ "Orlando City SC – Recognized Supporter Clubs". OrlandoCitySC.com. Retrieved August 9, 2017. ^ Orlando City SC. "International Fan Clubs". Archived from the original on April 10, 2017. ^ "Orlando City SC Officially Sell Out the Citrus Bowl for Home Opener vs. NYCFC". Empire of Soccer. Archived from the original on March 4, 2015. Retrieved March 6, 2015. ^ Michael Parsons, FLORIDA TODAY (March 2, 2015). "Orlando City Soccer Club's first game a sellout". Florida Today. Archived from the original on April 2, 2015. Retrieved March 6, 2015. ^ Orlando City SC. "New year. New @KingstonOC". Twitter. Archived from the original on April 17, 2017. ^ "Players". Orlando City Soccer Club. Retrieved March 15, 2019. ^ "Coaching Staff". Orlando City Soccer Club. Archived from the original on October 9, 2014. Retrieved November 26, 2014. ^ "Board of Directors". Orlando City Soccer Club. Archived from the original on October 9, 2014. Retrieved November 26, 2014. ^ a b "Orlando City looking for offseason reinforcements both at home and abroad". 6 May 2016. Retrieved 19 November 2018. ^ a b "Orlando City SC Announces Formal Affiliation with English Premier League's Stoke City FC". 6 May 2016. Retrieved 29 June 2018.